She turns a dial, and the sealed enclosure starts to fill with poison gas — hydrogen sulfide. An ounce could kill dozens of people. The rat sniffs the air a few times, and within a minute, his naturally twitchy movements are almost still. On a monitor that shows his rate of breathing, the lines look like a steep mountain slope, going down. At first glance, that looks bad. We need oxygen to live. If you don't get it for several minutes — for example, if you suffer cardiac arrest or a bad gunshot wound — you die. But something else is going on inside this rat. He isn't dead, isn't dying. The reason why, some people think, is the future of emergency medicine. You see, Roth thinks he's figured out the puzzle. "While it's true we need oxygen to live, it's also a toxin," he explains. Scientists are starting to understand that death isn't caused by oxygen deprivation itself, but by a chain of damaging chemical reactions that are triggered by sharply dropping oxygen levels. The thing is, those reactions require the presence of some oxygen. Hydrogen sulfide takes the place of oxygen, preventing those reactions from taking place. No chain reaction, no cell death. The patient lives. Okay, so this is more like a form of suspended animation than an on/off switch. As the article notes, metabolic reactions continue, just at an extremely slowed rate. 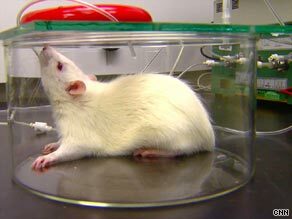 But it's quite similar in effect; in rats, at least, it appears that immersing them in this gas is like turning them off without killing them, and putting them back in regular air seems to revive them as if nothing had happened. If it can be safely used by humans, this apparent state of suspended animation would be very different from the related techniques that are now available. Barbiturate-induced comas, increasingly used in medicine during the last two decades, only shut down the brain, not the whole body — and their safety is debatable. And cryonic freezing is not currently reversible. The potential therapeutic and not-so-therapeutic applications of this new technique — again, assuming that it works on and is relatively safe for humans — boggle the mind. The CNN article sticks strictly to the therapeutic applications. It would allow for new ease in surgeries, like open-heart operations, that temporarily disrupt metabolic processes. You can also imagine the potential in emergency situations, to shut someone down until he can be rushed to the best facilities. Or you could put someone into suspended animation while she awaits a donor organ. The notion of a human on/off switch really reminds me — to put my nerd cards fully on the table here — of an episode of Star Trek: The Next Generation, "The Measure of a Man." In that episode, Data, an android, is put on trial to determine whether he is a sentient being with rights (a person), or property of the Federation (a machine). In order to demonstrate that he is not a person, Commander Riker first removes Data's arm and then, as a closing argument, abruptly walks up behind him and flips a switch on his back that shuts him off. Data falls forward onto the table, rendered a mere hunk of metal (or "bricked," to use the parlance of our times), and Riker proclaims, "Pinocchio is broken; its strings have been cut." Aside from the obvious ethical problems of the human on/off switch, I wonder on what grounds we can maintain our sense of personhood when we come to understand ourselves as mechanisms rather than living beings? "Children are 'constructed' from the 'building blocks' of their parents' DNA. Are they property?" Whether the form of life is carbon-based or silicon-based or purely immaterial, personhood is a broader concept and I think more resilient concept than you seem to imply. Certainly, the ability to 'freeze Han Solo' would raise new questions about personhood. But as Wittgenstein points out, our concepts adapt with their changing applications; the important thing is not to let overly-outlandish-possibilities (such as Parfit's imagined fission) confuse us about those things of which we have a sound common-sense grasp. And moreover, the example of Han Solo provides us with an important starting-point for reflection on personhood. It is grounded not so much in consciousness nor continuity of memory as it is in the narrative unity of one's life, provided both by one's own telling and the telling of one's community and tradition. 'A person is a character abstracted from a history,' writes MacIntyre; individuals can only be made sense of within the context of communities, rather than vice versa. Very important points, Brian. I agree with you that our grounds for believing in our own personhood need not be diminished when we comprehend our biological mechanics (and I probably should have made that clear). My point was more that that our sense of personhood is likely to be diminished anyway, except perhaps for the few like yourself who grasp why it shouldn't be — and even then perhaps still. Think about what modern psychology and psychological drugs have done to our sense of our own emotional lives. Given the rational grounds you've outlined, it shouldn't diminish us to understand that our emotions not just do but must have mechanical correlates and therefore potentially also mechanical causes. But there is a sense of loss anyway. This may not be true for something like a human on/off switch; I suspect the problem is severely more acute with matters pertaining to the mind. Indeed, modern medicine is built largely on the successful presumption that we can treat the body like a machine of some sort. It may be that such an innovation wouldn't result in any sort of sense of diminishment of our humanity, but I don't think it's a foregone conclusion that it wouldn't, so it's something worth paying attention to one way or the other. The medical examples are just what is needed. If one takes a Cartesian view of oneself, I think our successes with pharmacology actually deepen that view: the body is a machine, and 'I' am located in my mind, whatever that is; so if I need a nicotine patch or a SSRI to get the machine functioning as I want it, well, it's a triumph of mind over matter. And in that case, absolutely, such discoveries do threaten a "diminishment of our humanity." The point I was trying to make earlier is that they do not do so intrinsically; it's only insofar as they seem to reinforce bad philosophy that they are harmful.